Jack thinks he has found the perfect way to enjoy his summer and earn some decent money at the same time. His girl friend's father arranged the deal which has Jack spending the summer on an island while he takes care of two young children. He will be entertaining the kids and keeping an eye on them until the school year begins. The two children, Flora and Miles, are orphans living with a housekeeper in an unusual house on an island owned by their uncle. The uncle keeps his distance letting the housekeeper deal with most of the decisions involving the children. Jack quickly learns that the children are pleasant but rather odd. They don't appear to have much interest in sports or outdoor activities, although, they are willing to participate in the games Jack suggests if only to humor him. Once Jack learns how to navigate the huge house, he begins to enjoy himself. The children like to explore, and many of their afternoons are spent wandering the island with a picnic lunch prepared by the housekeeper who is an excellent cook. As the weeks pass strange things begin to happen. On the ferry trip to the island, Jack chatted with several people who warned him about the island. They suggested mysterious events and even the possibility of ghosts. At the time he pushed the crazy stories aside as unimportant, but now they seem to be coming true. Author Francine Prose has succeeded in creating a suspenseful thriller in THE TURNING. Told through a series of letters from Jack to his girl friend and his father, THE TURNING will not only keep readers turning page but also keep them awake at night. The only place Josh wants to be is on his skateboard. He loves the freedom and the challenge of skating and doing tricks. Unfortunately, just like most of us, the rest of life sometimes gets in the way. Author Janet Eoff Berend captures the spirit of skateboarding as well as the angst of the teen experience. Josh is struggling with issues faced by many teens making VERTICAL a sure success with teen readers even if skateboarding isn't their thing. Since Josh's main interest is skateboarding, his schoolwork is suffering. His parents are insisting that he attend math tutoring sessionS several times a week, and if his grades don't improve, his skating time is in jeopardy. Josh's buddy Brendon is also having grade troubles, but his solution is to dropout and choose an alternative school for his education. Brendon also disappoints Josh by hanging with some delinquent skaters. Josh has another problem. Recently, he witnessed one of Brendon's new friends stealing a wallet and several other items from a parked car. Josh knows what happens to a 'rat', but he is torn about whether or not to report the crime. The secret is eating away at him knowing that reporting the crime is the right thing to do, but that it could also make his life miserable. Here's my review of the MEMORY BOY sequel, as promised. Back in the city, Miles would rather be anywhere but school. More interested in his tools and building things, Miles is not a dedicated student, and when he hears about the oral history project that would require chatting with an elderly resident of a nearby nursing home, he tries his hardest to figure out how to get out of it. Now, his family's very survival depends on the things he learned from Mr. Kurz's stories. At the time the old man was rambling on, Miles spent his time working on his refurbished skateboard trucks or some other hands-on project that would keep him awake during his visits with the old coot. But, thanks to Miles's exceptional memory (Memory Boy), he now remembers all the survival skills Mr. Kurz passed on. The other huge benefit of having gotten to know the old man is that Miles and his family have a home. After the disappointment of finding squatters living in their family cabin on Gull Lake, Miles presented the idea of searching for Mr. Kurz's mountain cabin. It needed a ton of repairs, but Miles was up for the task, and he even found a way to add a small room so he and Sarah didn't have to bunk with their parents. 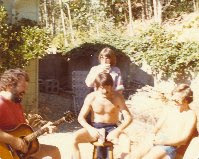 The family is still considered by most to be Travelers and must battle discrimination when they venture into town, but life in the cabin on the river is much better than what life in the city has become. Miles is busy getting the place ready for winter, and Sarah decides to begin attending the local school. Even their father is beginning to adjust to the country life. Just when things seem to be falling into a normal routine, Sarah has problems at school and their status as Travelers could ruin everything. This city family may need to learn the violent ways of the wild and do it quickly if they hope to survive. I don't know how I missed this one, but the mistake has been corrected and I'm glad to share the news here. MEMORY BOY by Will Weaver is an uncomfortably, believable tale of environmental disaster. Set in 2008, it is the story of the aftermath of worldwide volcanic eruptions that have created ash clouds that have caused pollution, crop devastation, fuel shortages, and more. The story follows one family's attempts to survive. Miles Newell, his sister Sarah, and their parents have decided their Minnesota suburb is becoming too dangerous. The city was hit hard by the effects of the volcanic ash resulting in food shortages, violence, and looting. The family has decided to head to the summer cabin they own and hope that things are better there. Using the strange contraption invented by Miles, combining pedal-power with what resembles a sailboat on land, the family heads out to find greener pastures in the country. 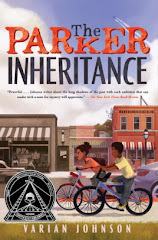 Amazingly some areas seem to have weathered the disaster better than others, however, Miles and his family soon learn that strangers are not welcome. One rest stop for the travelers finds them paying nearly $100 for breakfast at McDonalds. Folks along the way make it clear to the Newells that if they aren't locals, they better be prepared to move along and do it quickly. With their summer cabin in sight, the family feels a surge of relief that their journey is over. However, the presence of two other families already living on their property creates fear and frustration they weren't anticipating. Now what will they do? Returning to the city is not an option, but finding a home is necessary to their very survival. Will Weaver, author of FARM TEAM, SATURDAY NIGHT DIRT, SUPER STOCK ROOKIE, and others, has found me again with MEMORY BOY. I am eagerly sharing it with my students because it is very similar to MONUMENT 14, a book we read earlier this year. I know they will like this one, too. I am also excited to be able to share that MEMORY BOY has a sequel, THE SURVIVORS, which I am currently read and will review soon. I borrowed this one from one of my students the other day. I love it when kids have parents who spend money on books! THE UNDERDOGS by Mike Lupica has Will Tyler trying to save football for the twelve year olds in his town. After a solitary workout on the town field left him stumbling when his foot landed in a hole in the neglected turf, Will decided he wasn't going to sit back and accept the fact that their team would not be able to play this year. Forbes was hit hard by the economic recession. The famous athletic shoe company in town closed leaving the community devastated. What money is available barely sustains the high school football program much less a program for younger players. Will has real talent according to anyone who has seen him play, and he doesn't want to give it all up because finances have dried up. He takes a chance and writes a letter to New Balance and makes a plea he hopes will save the team. A return letter arrives with news that New Balance will sponsor the team, and Will gets down to business recruiting players. Unfortunately, building a team isn't as easy as Will thought. Finding a coach seems impossible and fielding even eleven players proves to be a challenge. Will's pleading finally convinces his father to be their coach, but when the eleventh player Will succeeds in recruiting turns out to be a girl, it might be more than the new team can tolerate. Author Mike Lupica once again takes readers into the heart of sport. Young football/sports fans will easily champion Will Tyler as he battles to revive a sagging team in a dying town. Good play by play action combined with behind the scenes tension make THE UNDERDOGS hard to put down. Long before Chris Crutcher or Charlie Price were award winning, YA novelists, they were hippie teachers, wrangling kids at a "last chance" alternative school in Oakland, California. To celebrate their shady history and their new book releases, Chris and Charlie are asking three bloggers to help them give away a few books -- and inspire a few laughs at their expense. Post a caption for one or all of three vintage 70s photos -- on the blogs or on Facebook -- and you'll be automatically entered to win a free signed copy of DEAD GIRL MOON by Charlie Price AND a free signed copy of PERIOD 8 by Chris Crutcher. Chris and Charlie will hand pick the winners, so let yourself go crazy. Funny is our mission. And with these classic images, how could you go wrong? Must be 16 or older to enter. Contest closes on April 1, 2013. Prizes will be distributed by April 15. Three runner's up will win signed ARCs of Period 8, so if you're a collector of signed ARC's, try not to be TOO funny. If you have trouble posting your caption, send them to Kelly Milner Halls at kellymilnerh@aol.com and she'll be sure you're safely entered. May the grooviest entries win! Here's the picture. Good luck!!! THIS IS THE NEXT STOP ON THE PRICE/CRUTCHER BLOG TOUR! Welcome to the Charlie Price and Chris Crutcher Blog Tour! Below you will find reviews for both DEAD GIRL MOON by Charlie Price and PERIOD 8 by Chris Crutcher. Also click HERE to enter the caption contest to win copies of both books! Three teens discover a dead girl and get involved in a whodunit mystery that could ruin their lives. Thrown together by circumstances beyond their control, they have to trust each other and scramble to stay ahead of the bad guys. Grace is a runaway escaping an abusive home life when she arrives in a small Montana town. Offered a temporary foster home and even a job at a local diner, Grace understands she may be involved in something corrupt, but she plans to get her hands on enough money to leave and move on as quickly as possible. What she doesn't count on is forming a friendship with JJ, a girl related to and living with her foster family. Mick arrives in town with his father. Running from the law for stealing and fencing stolen property, Mick's dad picks the place because of a mechanic job available at the local Conoco station. Mick's mother left years ago leaving him to survive with his father whose interest includes cars and small time criminal activity not his son. Mick befriends JJ, and through her, meets Grace. He is attracted to Grace but knows he'll be lucky if he can get her to feel the same way. An afternoon of swimming and hanging out along the river turns into a nightmare for the three teens. They discover the body of another young waitress from the diner, and they are sure that one of the town's crooked leaders is responsible in some way for the girl's death. Since they have no adult they can trust, they begin their own investigation, but what follows are mistakes and missteps that result in Mick becoming a main suspect and Grace worrying for her own safety. Author Charlie Price creates a chaotic and action-packed adventure for Mick, Grace, and JJ. Reminiscent of B movies set in corrupt southern towns, the experiences of the three teens kept me on the edge of my seat as they battled against the odds to prove their innocence and solve the case. Scheduled for release in April 1, 2013, PERIOD 8 is an example of vintage Crutcher combined with a dash of mystery. I was almost breathless in the final 30-40 pages as the action rushed to a riveting conclusion. Crutcher grabs the attention of readers with intense character relationships and a quick moving plot. The ever-changing social fabric of high school mixes with the mystery of a missing student to make this a real page turner. Hattie had the adventure of a lifetime when she tried to make a go of her uncle's Montana homestead. There were good times and bad, but Hattie wouldn't have traded them for anything. She made long lasting friends, and they continue to support her endeavors. After leaving the homestead, working in the boarding house enables Hattie to repay her late uncle's debt and set aside a bit for herself. In this new adventure Hattie encounters a traveling theater group and joins them as their wardrobe mistress. She has mixed feelings about leaving her new, comfortable circumstances, but her dream to be a newspaper reporter convinces her that this might be her only chance. Hattie arrives in San Francisco and is amazed by its awesomeness. In her free time she explores. She finds the huge buildings that house the city's three newspapers. A stroke of luck lands her a job at one of the papers. True, it might be just a job as a cleaning woman, but it gets her closer than ever to the job of her dreams. A combination of Hattie's determination and being in the right place at the right time, allows Hattie to show off her talents as a writer. Her dream seems to be within reach, but along the way she may find she is losing other things she has come to know and cherish. THE BLOG TOUR IS ABOUT TO BEGIN! These two great books will be featured on a blog tour over the next three weeks. Readers will be able to read the opinions of three bloggers AND have fun entering contests to win signed copies and ARC's of both books. 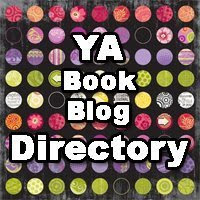 Read on to find links to the blogs that will feature DEAD GIRL MOON by Charlie Price and PERIOD 8 by Chris Crutcher. Thank you to Caroline B. Cooney for sharing Janie with readers one final time. I enjoyed all the Janie books, but I didn't know we would be treated to yet another. It is a nice conclusion to her story. For those of you who haven't read the Janie saga, it starts with a teenage girl eating lunch with her friends in the high school cafeteria. When Janie looks at her milk carton, she recognizes the face of the missing child pictured on the carton. It is her own picture at the age of three. What follows is a captivating story about how Janie had been kidnapped and left to be raised by another family. She struggles with the fact that she loves this second family and has actually forgotten her original family. She knows if she reports the discovery of this picture and her true identity, she will be ruining the lives of people she has come to know and love. Eventually she is introduced to her biological family and then she must learn to adjust to having two families. In this new and final book, JANIE FACE TO FACE, Janie is in college and trying to live independently of her families and the crazy media circus her story created. Living with people who don't know her past is a refreshing change. When she meets a nice young man, she even thinks she may have met someone who could replace her beloved Reeve. Janie isn't really ready to introduce Michael to either of her families, but he manages to arrive on scene when Janie is visiting the parents she refers to as her "kidnap" family. When Janie discovers Michael taking pictures of her father on his phone and texting them to an all too familiar phone number, she knows his intentions toward her are suspect. Since the phone number she recognizes belongs to author supposedly writing a questionable book about her kidnapping, she realizes Michael has only gotten close to her to further the research he has been hired to do for the author. Her frustration and fear drive her to hop on a flight to visit Reeve. The trip rekindles their romance and has them both realizing they never want to be apart again. In alternating sections readers also meet Janie's kidnapper. Hannah has new plans of her own. Having never forgiven her own parents and the little three year old Janie who she sees as having ruined her life, Hannah is out to get revenge. She is plotting a way to get even, but if Janie's family and friends have anything to do with it, she just might end up spending the rest of her life in prison.